After the total snafu with my carburetor I had some forced downtime while I waited for the correct carb kit to arrived. I took advantage of that to fix some annoying things in the area. First on the list is a major oil leak. 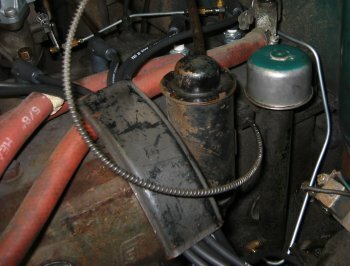 The car has a partial-flow oil filter that takes pressurized oil from the oil pump bypass valve, runs it through the filter, then drains it though a return line to a fitting on the oil filler tube. This return line is visible along the left hand edge of the picture. It always leaked somewhere behind the engine (enough to leave puddles if the car idles in one spot for a few minutes). It also is routed funny and looks like hell. I removed the entire line and bent up a new one from 3/16″ brake line. 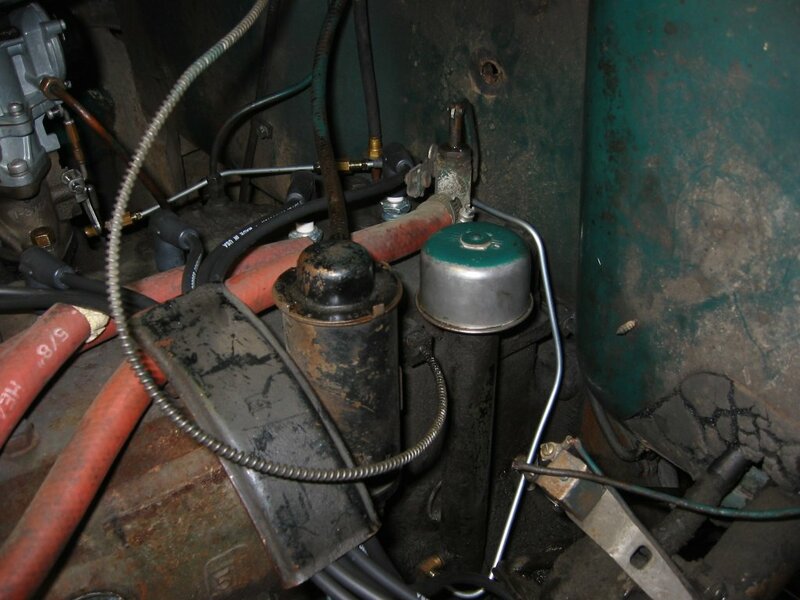 At left is a shot from the driver’s side of the engine. You can see the new oil line snaking from the filler tube across the rear of the cylinder head then down around the carb. At right you can see where it attaches to the flexible line from the filter. 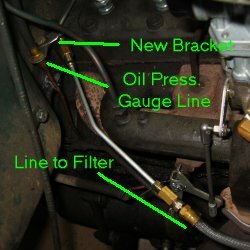 I fabricated a small bracket to attach the line to the existing bracket for the oil pressure gauge line. By sharing that bracket I could avoid drilling any holes or anything else drastic. Best part is that it does not leak a drop. 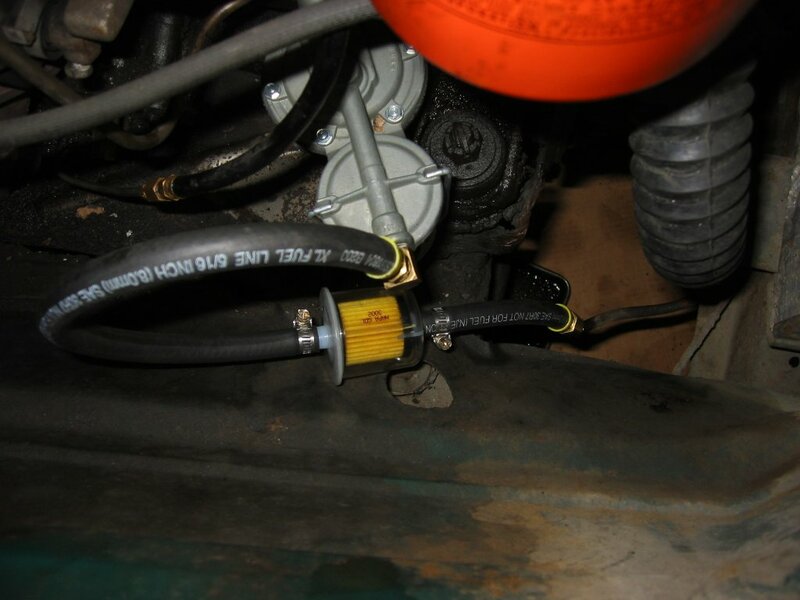 The flexible fuel line leading to the pump is getting hard and I really want to keep dirt out of my newly rebuilt carb. With help from Andy at my local NAPA I put this together. The filter is not near anything hot so I went with a plastic model for easier checking. We will see how that works out. So far it seems to work fine. 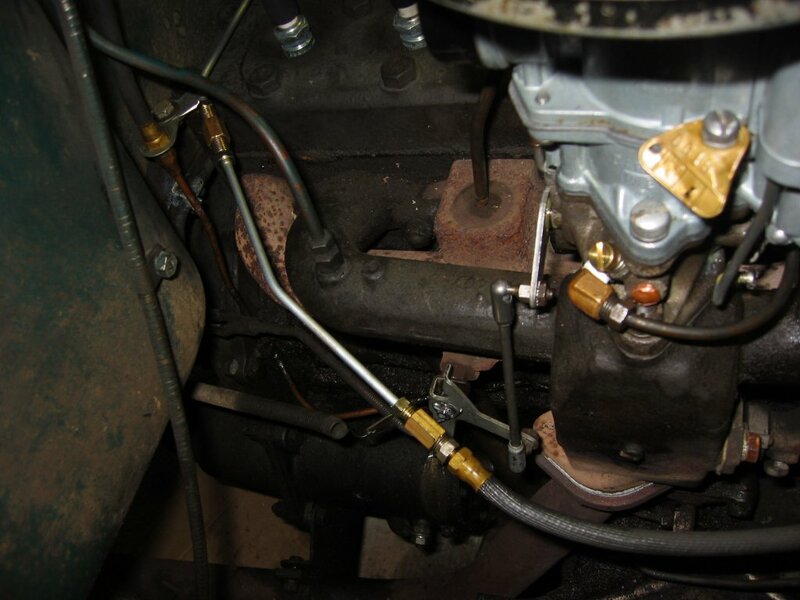 While working on the other bits I noticed the gasket between the exhaust manifold and down pipe was leaking. 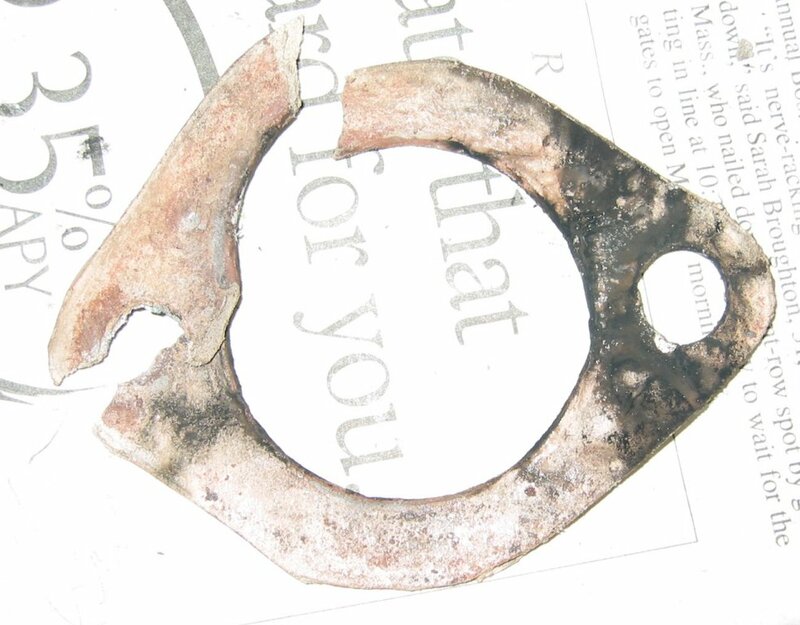 I took it loose and found this POS asbestos gasket. I replaced it with a much nicer metal/fiber gasket with a sealing ring. The nuts holding the pipe on were brass. I guess someone did not want them rusting on. It worked! 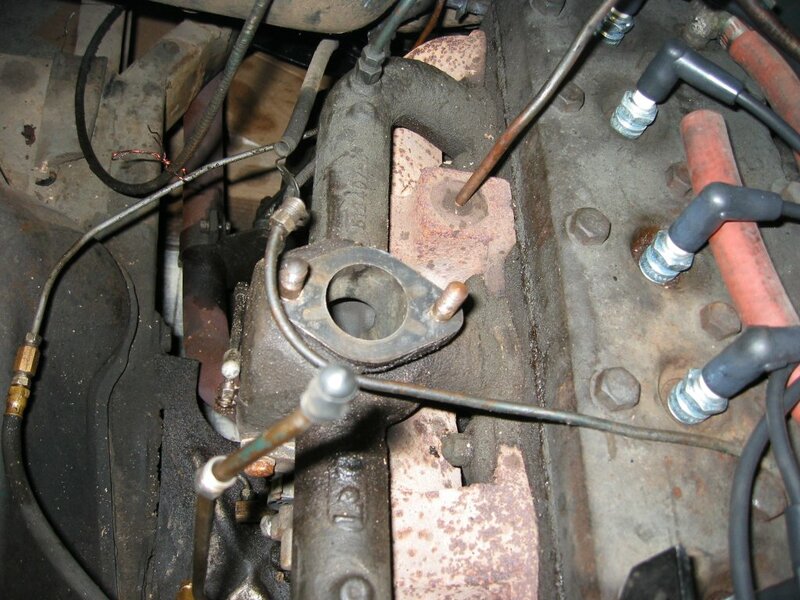 On the first picture, the spark plug wires run through a metal shroud. How does one open that shroud to replace the spark plug wires? It does not open up. You have to take the boot off one end of the spark plug wire and fish the wire through then put the boot back on. Usually the distributor end is easier.